At Jawbone, I was a design intern working within the UP team. One project I had was to come up with my own implementation of a, then upcoming, feature, Today I Will, for the UP app on iOS (just before iOS7 and UP24 launch). I had a month. This project involved researching and rethinking behavior models, as well competitive analyses and content audits of motivational systems, to consider an ideal goal and behavior creation, change, and management system within the UP community ecosystem. I was the lead designer on this experience and my insights and work aided the greater Jawbone Up team efforts for Today I Will. Prior to my internship, the UP team was working on a new motivational system, Today I Will, for the Jawbone UP mobile app. The UP team ideally wanted a system that could encourage users to commit and make strides towards daily goals. The existing app at the time was focused around logging information (activities, meals, sleep, mood, and steps), gaining insights, and sharing with your friends. The app had a system in place of goals, but it was very basic and required the user to have a set level of commitment and interest already there. With the resources of community, data, and insights, we felt there was an opportunity for a more compelling means of creating, viewing, tracking, and succeeding at goals. Ultimately, we wanted to be able to think about a new way for people to commit to a goal and see it through. The UP team had a solution in mind, but I was tasked with coming up with a potential alternative solution. How can we encourage behavior change, goal creation, and goal completion? Create a solution that considers ways of impacting behavior, while also pairing well with the existing UP environment. There was so much for me to learn in order to tackle this project. I was very excited to just dive as deep as possible. My research was a mixture of ethnographic processes of contextual inquiries, analyses of goal-focused apps, as well as findings on behavior models for behavior change or rewards systems. The most relevant information I had on behavior influence, at the time, was my knowledge of reward systems from an organizational behavior course that I took the previous semester at Carnegie Mellon. I wanted to learn about behavior change in a variety of contexts. I followed my curiosity to research without discrimination. At first, I discovered the use of behavior models in global economic and social systems. These models carried varying levels of complexity and variables. I found The World Bank's outline of major theories to be very helpful. In considering a model that would be inline with the UP system, I was interested in a model that could use our existing resources with as little complexity as necessary. I initially thought an appropriate model could be based on social cognitive theory, where behavior can influence and be influenced by personal factors and environmental factors. I thought such a model would be relevant to our system because of our use of community, who provide encouragement or empathy, and our insights engine, which educates to inspire action. However, a concern I had with this model's complexity was that the social cognitive theory model has to be skewed more to factors outside of our system's constraints, such as self-efficacy, self-control, and outcome expectations, to take into account the user's psychology and abilities. Another model that I fancied was the theory of planned behavior. The theory of planned behavior was interesting because it supported the idea of attitude (of the person) and subjective norms (beliefs or thoughts of others), affecting intent and leading to behavior. This supported the idea of a Today I Will feature that could have users with some attitude and initial intent, committing to increased intent and behavior (successful completion of a goal). Through further research, I learned of Dr. BJ Fogg and his behavior change model. Under Fogg's model, for a behavior to occur, three elements (motivation, ability, and a trigger) must converge. Therefore, when a behavior does not occur, at least one of these elements is missing. I thought this was very compelling. Fogg's model appealed to me because at it's core, it's a simple model, but it allows room to focus on specific psychological elements and qualities of a user experience. I thought Fogg's definitions of subcomponents for motivation (e.g. pleasure/pain, hope/fear, social acceptance/rejection), simplicity factors that affect ability (e.g. effort, time, non-routine, social deviance), and types of triggers (signals, sparks, facilitators). I felt that Fogg's model was the most flexible and appropriate model for my Today I Will model, but I wanted to further explore models by researching the existing market of goal focused apps. My research led me to a variety of apps and systems specifically focused goals, motivation, and behavior change. These varied from community driven apps, like Lift, to simpler systems, like 43Things. The apps that I dedicated much of my focus towards were Lift, Fig, and Basis Habits. I analyzed models and user flows for a variety of operations in these systems via a process of content auditing and ux auditing with the goal of gaining useful insights and possible ideas for an ideal UP flow. At this point, I had a fair idea of what the ideal -- something that could induce behaviors and achievement through inspiration and motivation rather than punishment. I wanted to go deeper into the context and ux aspects of Lift and Fig as there seemed to be elements that could fit with the UP system. I sought to find a deeper understanding of suggestion / goal suggestion implementations that could exist in up by closely examining Fig and Lift. 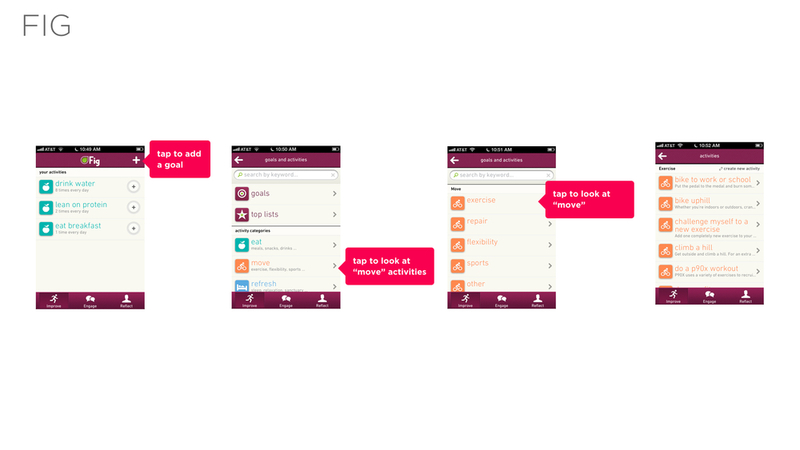 This gave me a sense of how the UP app could use it's existing resources to improve. • focused primarily on holistic lifestyle and community rather than just health. How this fits with UP? UP can’t track. UP could also use these simple activities / goals to motivate people, who aren’t in an active mood, to be somewhat active and interacting with the app. 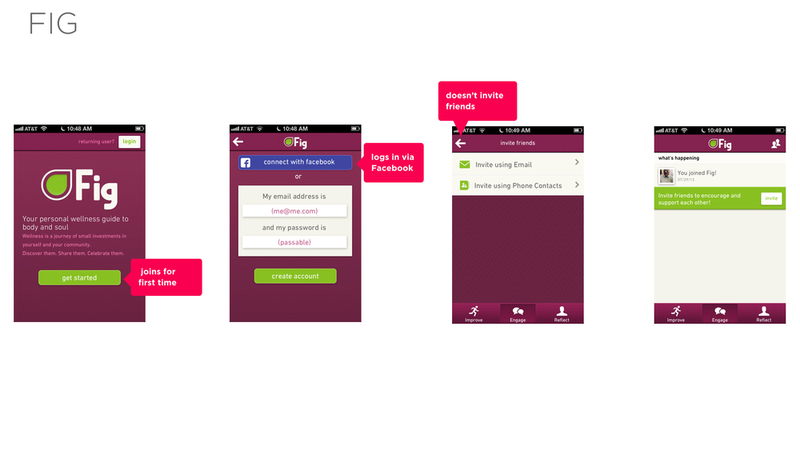 Fig has a social focus involving following friends, but also has activities focused on other people, such as having a daily checkin with a close friend. Up could use this for more teammate interactions and possibly fostering interactions between UP users and non-UP users. Possibly add more active actions to teammate page other than comments. • focused on habit and behavior development and maintenance! • e.g. small habits, such as floss, to bigger habits, like running, to achieve goals, such as being more healthy. • thriving community, featuring a variety of contributors. • groups an assortment of habits to achieve a particular goal, with a community following for support! Most Popular habits on Lift? From the data that UP collects, we can make recommendations on habits to develop. Which could in a subtle manner help the suer to achieve goals and milestones that they didn’t think of. e.g. The user followed suggestions and eventually became a better runner. A stronger community focus on interests could assist in automatic habit building and discovery. Community can also assist in motivation. • Could be presented as a “Try This” action, which ultimately leads to very specific milestone that would reward the user for their effort, but also astound them with how far the users have progressed. • Curation of posts by teammates to boost morale. • e.g. a post specifically created by a teammate for another teammate for the sole purpose of boosting morale / progressing / trying a new activity. I wanted to explore the user experience in Lift and Fig to make note of particulars that may be conducive to the goal execution and creation cycle. What I found here was that having a sense of community was key to success and the continued use of the app. I wanted to see qualitative information and a variety of perspectives for existing UP users. I wanted to understand how they use the app and whether there were particular factors that might have helped them to achieve and set goals. Through contextual inquiries, I conducted interviews with a variety of diverse UP users. I was able to divide these users into persona groupings of casual and non-casual users. The casual users didn't use the app for goal driven purposes. They did get a sense of enjoyment when they completed a goal through their use, but they weren't committing to goals. The non-casual users were actually the opposite. They had at least one goal daily and were committed to seeing it through. A big connection that I saw from these findings was that the users' choice in goals and their execution was an independently driven process, lacking community motivation at the earlier stage. I began to think of two core experiences: discovery / goal creation and motivation. For motivation, I considered the idea of a coach that would start in the UP app's "Story of Me" feed. This coach would act as a behavior trigger through notifications outside of the app and would motivate action by goal state and messaging within the app, once a goal was pledged. For goal creation, I considered the idea that Today I Will could be a triggered feature within the existing feed activity logging ui, where users could at their own will choose to create or set goals. In my flow, I also considered the possibility of particular goals already existing in the feed. For my prototype, I decided to focus on the discovery and creation elements of the experience, as this was a very key part of the problem that we were trying to tackle. Here, I consider Today I Will as a contextually aware system, where given your tendencies and activities, you'll have meaningful suggestions, as well as a gallery of goals. Taking from my research, I wanted the goal creation experience to feel custom and personalized, while also feeling like a true commitment. 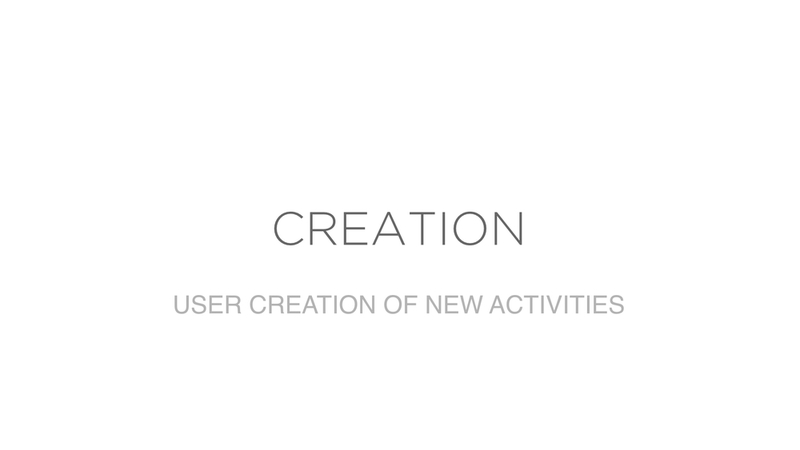 To do this, I considered making the goal creator feel like a pledge / commitment to success for the user. I also considered using existing user information, such as location or pictures, to make the goal feel like something the user already has a personal connection to. I also felt that customizability would allow for the experience to be more personal and lessen the perceived difficulty of a goal. To also lower the ability factor, I consider a la carte goals presets in the gallery, where users could choose from a variety of goals with varying factors to ease goal creation and commitment. My aesthetic and visual design was inspired partly by our existing food logger, but I had room for added creativity and personalization via our style guide as well. Ultimately, for the initial launch of Today I Will, the team went an alternate path, focusing on just suggested goals that appear every-so-often. However, my work and research helped the team to consider a variety of approaches to goal creation. My work helped to show the importance of triggers and community for behavior change. I learned a lot on this project and had a lot of fun throughout the process. I think my end solution and ideas work better for post-initial launch versions. However, I think my research and work were very thorough and I enjoyed it all.